Pen & Sword Maritime Books Ltd. The Washington Naval Treaty of 1921 and subsequent treaties in the 1930's effectively established the size and composition of the various navies in WWII. In particular they laid down design perimeters and tonnage limitations for each class of warship including battleships, aircraft carriers, cruisers and destroyers. With one or two exceptions, battleship construction was deferred until the mid 1930's, but virtually all navies embraced the concept of the 8 in. gun armed 10,000 ton navy cruisers and laid down new vessels immediately. describe the heavy cruisers designed and built to the same rules by each nation and then consider how the various classes fared in WWII and will attempt to assess which was the most successful. Ships from the navies of Britain, France, Italy, Germany, the USA and Japan are included. 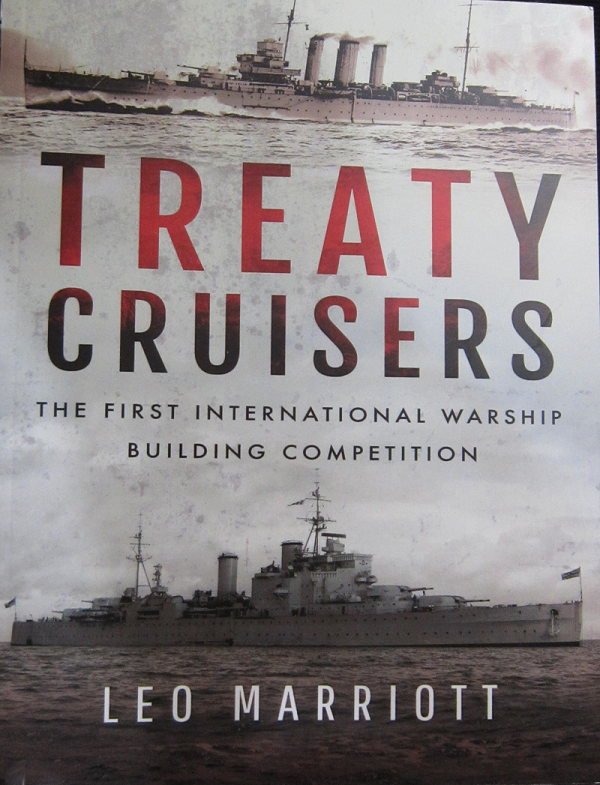 The author, Leo Marriott, is a retired air traffic controller who has had more than thirty books published on his specialist subjects: naval warfare and aviation. He is an experienced pilot and accomplished aerial photographer. Pen & Sword is based in England. The book is soft-bound of 176 pages in 6" x 8" page format. It contains 73 black and white photos and 12 line drawing profiles. There are 3 black and white photos of aircraft. The book has 4 appendices. The cover art shows black and white photos of 2 cruisers: the HMS Canberra over the HMS London. The back cover has a black and white photo of the Italian cruiser Zara. The back cover says "Colour profiles of all ships included will interest model makers." However, there are NO color profiles in this book. I want to thank Casemate Publishers, who sent me this sample book and Pen & Sword.